Posted By:Unknown | At:11:43 AM Be the first to comment! 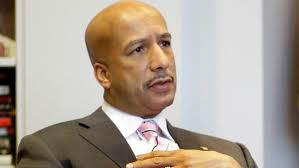 NEW ORLEANS —Former New Orleans mayor Ray Nagin, the businessman-turned-politician who became the worldwide face of the city after Hurricane Katrina, was sentenced to 10 years in prison Wednesday. Nagin, based on sentencing guidelines, had faced a possible sentence of 12 to 30 years. A jury convicted Nagin of accepting hundreds of thousands of dollars in bribes -- money, free vacation trips and truckloads of free granite for his family business -- from businessmen who wanted work from the city or Nagin's support for various hurricane recovery projects. Prosecutors asked the court to send Nagin to prison for a long time. They argued that he was found guilty of 20 of 21 counts in the indictment, and that he participated in and orchestrated a years-long conspiracy to enrich himself and his family. The government also argued that Nagin spent years covering up his crimes and that his testimony during the two-week trial showed an "astounding unwillingness to accept any responsibility for his actions." Assistant U.S. Attorney Matthew Coman compared Nagin's crimes with those of other public officials who drew stiff sentences, including former Detroit Mayor Kwame Kilpatrick (28 years), former Illinois Gov. Rod Blagojevich (14 years) and former Birmingham, Alabama, Mayor Larry Langford (15 years). "Nagin's widespread and corrosive breach of the public trust - lasting through much of his tenure in office - equals even the worst of these state and local corruption cases," Coman wrote. Nagin's defense attorney Robert Jenkins petitioned the court for a lighter sentence. He argued that his client is a first time offender with no criminal record. Jenkins also argued that the allegations and evidence presented during the trial are a complete aberration to his otherwise outstanding life as a businessman, family member and citizen. "Mr. Nagin has been a devoted father, husband, and supportive child to his parents, and greatly cares for the well being of his family, and is their caretaker," Jenkins wrote. According to Jenkins, a 20-year sentence would amount to a "virtual life sentence." Jenkins noted that former governor Edwin Edwards received a 10-year sentence in a public corruption scheme that netted up to $5 million dollars in ill gotten gain. The court previously calculated Nagin's take at more than $500,000. Nagin received several letters of support, including from members of his family. His wife Seletha asked for Nagin to remain out of jail until allegations of prosecutorial misconduct can be fully investigated. "I am asking that you delay these sentencing proceedings until we are allowed to see all the reports that have thus far only been summarized but clearly show a pattern of prosecutorial misconduct," Seletha Nagin wrote. The letter by Nagin's wife also details the family's financial ruin and personal anguish. "We are mentally and financially drained," she wrote in her four-page letter dated July 1. "We have exhausted our savings, borrowed from family, gone on public assistance (for the first time ever) and even had to file bankruptcy to avoid being homeless. We have even sold much of our furniture and all of our jewelry with the exception of our wedding rings."